Travel 1½ miles to Hwy 19 South to Camilla and then go east on Hwy 37; Mitchell County Prison is approximately two miles down on the left. The Mitchell County Correctional Institute operates a 159 bed facility, housing 135 state inmates as well as 24county offenders. They also provide general labor for Mitchell County, by using their inmates to provide work on country roads and other Mitchell County Government projects. The Mitchell County Correctional Institution (MCCI), serves to meet the workforce needs of local governments while fulfilling a contractual obligation to the Georgia Department of Corrections by providing safe and secure housing for inmates in compliance with all applicable policies and procedures. 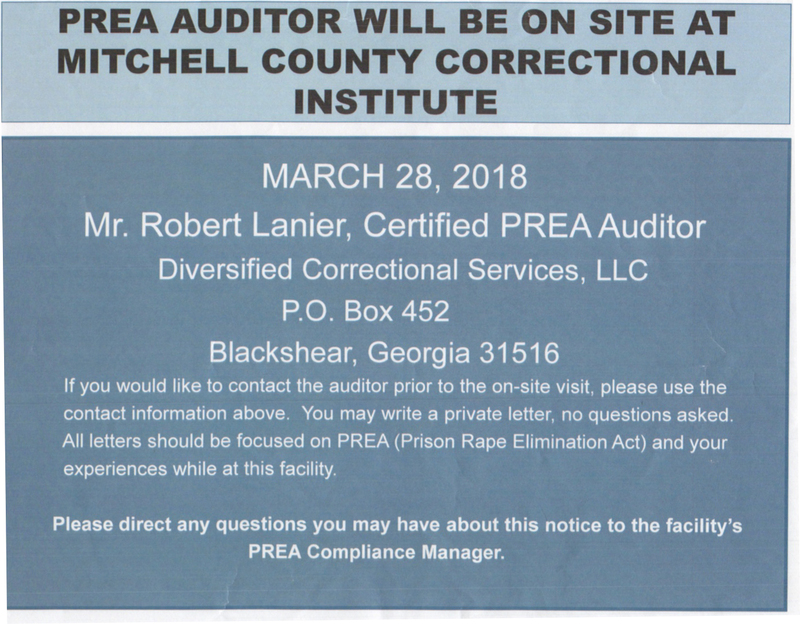 We are governed by the Mitchell County Board of Commissioners and also by the standard operating procedures of the Georgia Department of Corrections. The following are services that they provide. * These services are on a 24 hour basis. The Correctional Institute also provides programs to help the inmates such as academic, counseling, and religious activities.